Originated in Quebec, there’s nothing in the States quite like poutine. Although the basics of the dish are easy enough to describe — french fries and cheddar cheese curds topped with a healthy dose of brown gravy — given the extreme pro and con feelings among Canadians evoked by this dish I didn’t feel my words alone could do justice to poutine. 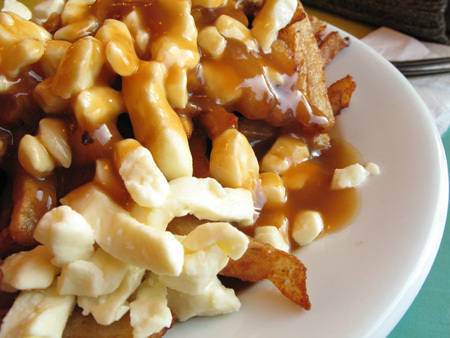 So what follows are some curated comments from more refined observers of poutine, which collectively provide a well-rounded sense about this peculiar Canadian food stuff. What a great post. I have never thought of Poutine as being odd, just something I grew up with. I love the quotes. Thanks for your comments. As a friendly observer of Canada, it’s interesting to me how many people have such strong reactions to poutine. Also I just looked at your Local Traveler NS site, which is quite nice and which I will plan to browse. I’ve also added it to my blogroll. Montreal can have their day in the sun for inventing poutine. Now maybe they can concentrate on making a half decent hamburger.